What happened when Joe and Victoria moved to a tiny Spanish mountain village, looking for a peaceful retirement? How did they become owners of the most dangerous cockerel in Spain? Who is Lola Ufarte, and how did the pair end up under house arrest in the Middle East? 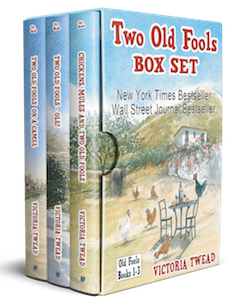 Find the answers here in the fabulous first three volumes of the New York Times and Wall Street Journal bestselling Old Fools series. Includes Spanish recipes from the village ladies and links to FREE photo books.